UPDATE: Caesar Millan, the self-professed "dog whisperer" is under investigation for possible animal cruelty. 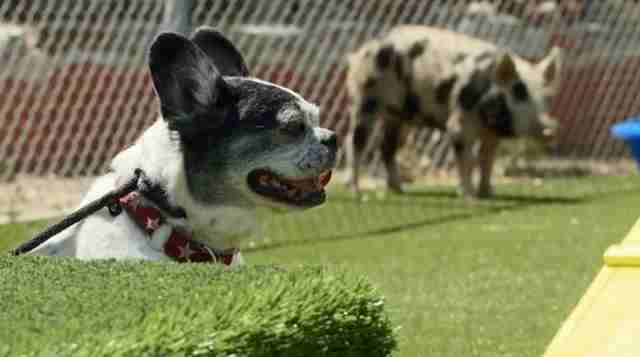 Can Cesar Millan get Simon, the pig-killing dog, under control? 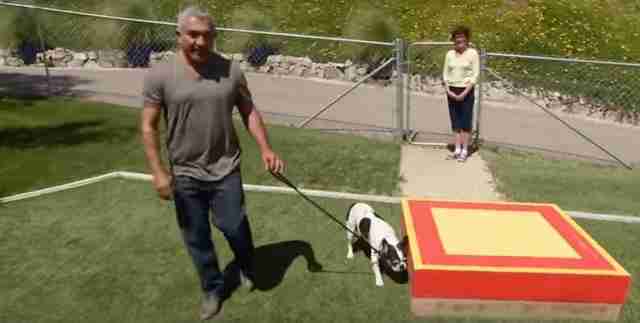 That's the tease to a February 26 episode of "Cesar 911," a show featuring famed dog trainer Cesar Millan and the supposedly wayward dogs he aims to set straight. The long, painful answer? No, he really, really can't and it took a bloodbath to prove it. A clip posted to YouTube last week shows a dog named Simon being dropped off at Millan's Dog Psychology Center (DPC) in California. Simon has already killed two pet pigs. Millan thinks he can curb the dog's penchant for harming them - by letting him hang around more pigs. "I'm going to use the fact that this is a new environment for Sandy to my advantage," Millan tells the audience. "And tackle his deadly problem." "If I can give him a positive memory with them, it will be a great foundation that will translate into better behavior with all animals," he says. For their part, the pigs are just chilling in the sun, bathing blissfully, unaware of the so-called pig-slayer in their midst. "Now, let's take the leash off," says Millan. Simon lunges at one of pigs, biting off a chunk of ear. Millan dives and rolls on the ground trying to tackle the frenzied dog. Another crew member snatches a pig by his leg, trying to drag him from the mouth of madness. The air is filled with squeals of terror. Again and again, Simon charges at the pigs biting and tearing at the cowering animals. The owner is in tears. Pigs are bleeding and wounded. "I got it. I got it." The clip has raised a storm of controversy on social media, along with a petition to get Millan off the air permanently. Jim Crosby, an outspoken animal behaviorist who has trained hundreds of dogs, thinks Millan may have even committed a crime under section 597 of California's criminal code. "Even if we let the first engagement slide as an accident," he writes on Facebook, "this documents several felony counts occurring in California at the 'Dog Psychology Center' as directed and permitted by the trainer. It may also qualify as 'baiting' under the various state and federal dog and animal fighting statutes." As this video posted to YouTube on Monday shows, Crosby is hardly the only dog trainer outraged by Millan's tactics. Despite legions of fans, Millan is no stranger to controversy. His approach to training has often been criticized for its focus on deterring behavior though negative reinforcement. In a 2012 episode, Millan came under harsh rebuke after a misbehaving dog was hanged by his neck during training. As in that incident, Millan is not facing charges from the "pig slayer" episode. Nor is he facing any official sanctions. He has not released a statement addressing the controversy. The Dodo has reached out to the trainer through the show's website, Cesar's Way, but did not immediately receive a response. In any event, Simon's hatred for all things pig will likely abide. Our nonexpert advice for the owner? Keep him away from pigs.